Dr Ally Moberley-Cavendish is a newly qualified female doctor. Which is a difficult and impressive thing in the 1880s. Recently married and living in Cornwall, she has taken a job in Truro asylum, giving medical attention to the inmates. Her husband, Tom, an engineer, is sent to Japan for work and their stories unfurl in the parallel narratives of their professional trials. As Tom becomes more and more absorbed by Japanese culture, Ally finds herself haunted by the sadness and anxiety of her upbringing, in particular, her difficult relationship with her mother, and the foundations of their brief marriage begin to slip. Signs for Lost Children picks up from Moss’s previous novel, the excellent Bodies of Light, although it can also stand alone, and continues her beautifully written and controlled exploration into family dynamics, particularly complex mother/child relationships (Ally’s mother Elizabeth is an admirable monster) and whether there is any possibility of escaping the repeating patterns of successive generations. It is also about madness and sanity, loneliness and determination, written with great precision, clarity and emotional resonance. 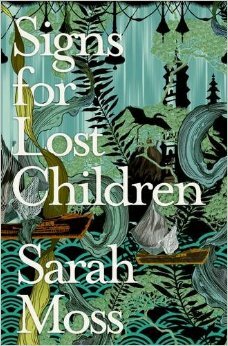 Sarah Moss has long been a bookshop favourite, and is now even more so after her recent visit to the shop, when she impressed us with her wit, erudition and niceness. She has had much critical acclaim and deserves to be more widely read as she is a writer of great talent, whose powers are increasing with each book. Buy it! And I’ve just read Night Waking, Sarah’s second novel and the book written before Bodies of Light and loosely linked to the other two. It’s set in the present day in the Hebrides where mother of two Anna wrestles with childcare and her doctoral thesis in an isolated cottage while her husband counts puffins, but it introduces us to one of the Moberley family through some old letters found in an attic. It is an interesting and satisfying read – witty, thoughtful and will strike a chord with all those who have paced the floor with a child whose body clock is obstinately out of sync with the rest of the family, but as Alice says, each of Sarah’s novels gains in strength….